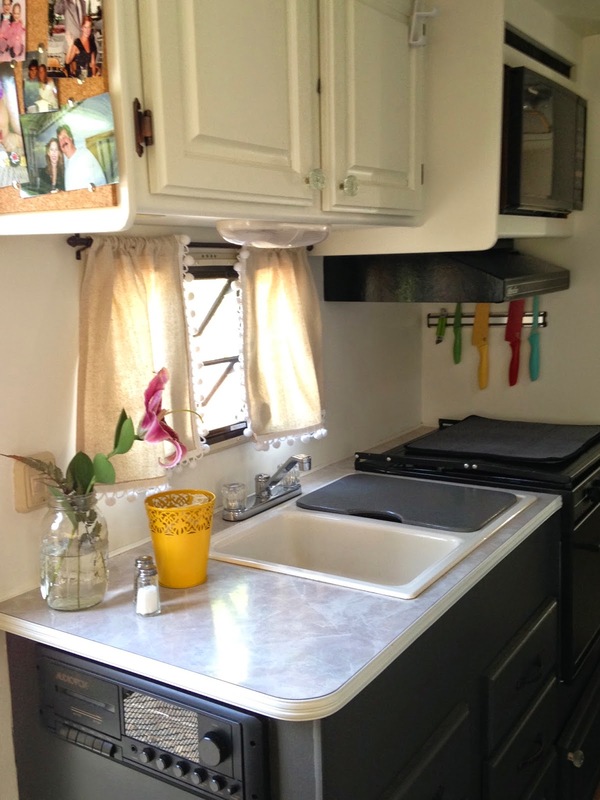 We've been using the camper this summer and I am so excited to share it with you. 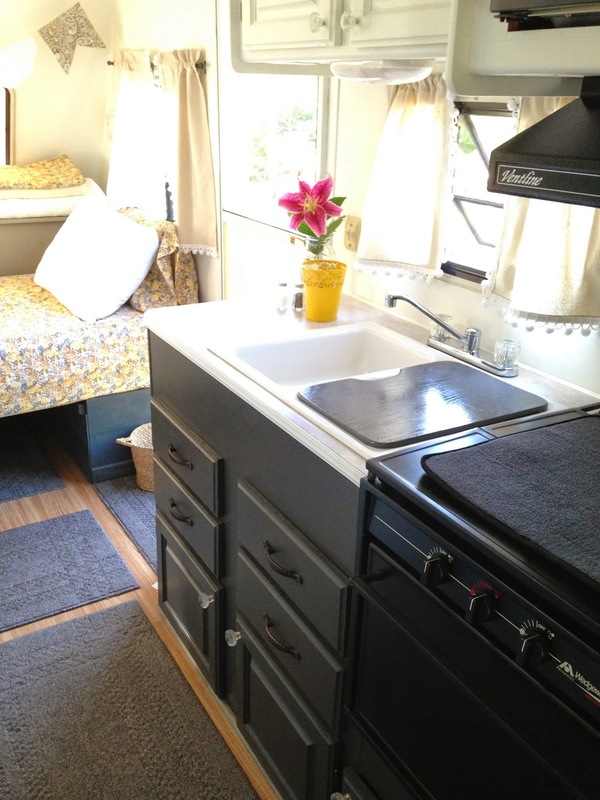 If you follow me on Instagram, you know fixing this camper up was a labor of love. Welcome and Enjoy the tour! 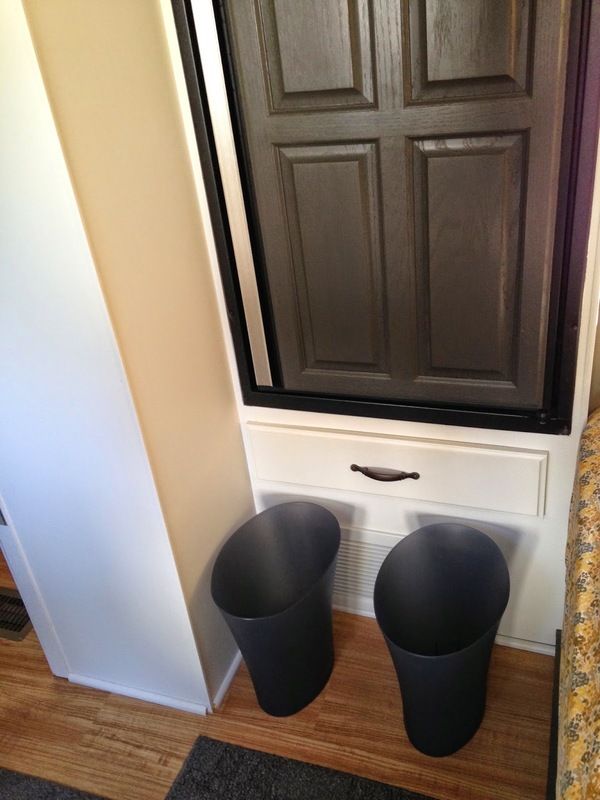 Kitchen Cabinets: Bases in Ebony Fields by Valspar and White Dove color matched to Behr on the uppers. Kitchen Hardware: Hinges and Pulls in Oil Rubbed Bronze from Lowes. Glass knobs (already owned). Curtains: Sewn from drop cloths from Lowes and trimmed with white pom fringe from Joann's. The rods are from Lowes in Oil Rubbed Bronze. The sink cutting board was spray painted gloss gray from Rustoleum and is not used as a cutting surface, but I use the gray drying mat from Lowes over it for wet dishes. The sink and counter tops were in good condition and shinned up with some elbow grease and Bar Keepers Friend. 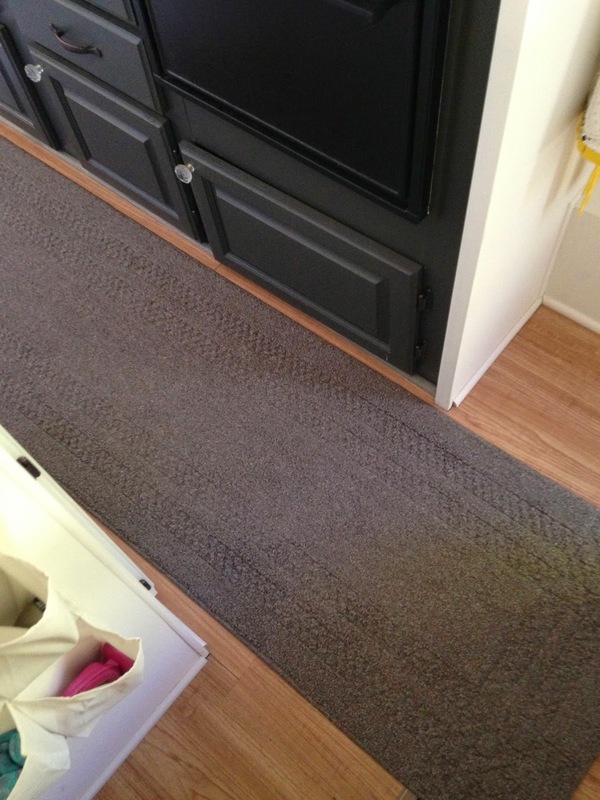 Flooring: Allure from Home Depot. It was off the shelf and is peel and click floating floor system. I really liked how easy it was to install. The cork board that I ordered from Amazon. It came in a 4 pack of squares and I used one on the upper cabinet side. 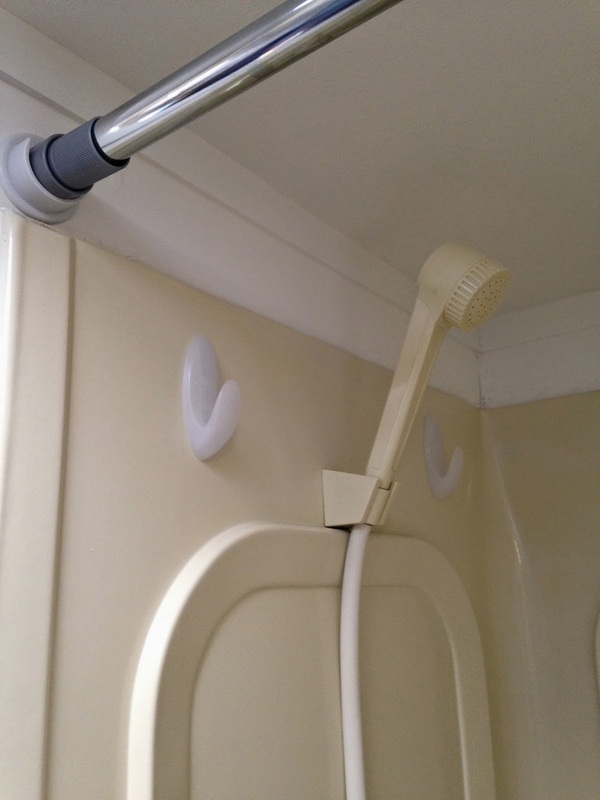 The over the door hook where I hang my hand towel to dry. The magnetic knife holder from Target and the colorful knifes from Martha Stewart/MACYS. The new double LED light from Amazon. The overall best thing is the radio & cassette player in the kitchen. I LOVE listening to my old mix tapes! There are speakers throughout the camper and it is the BEST. 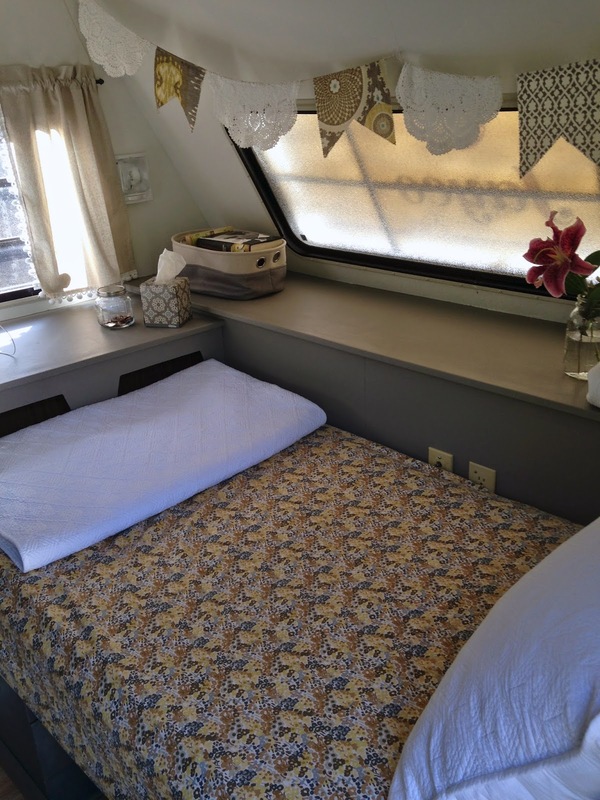 The dinette area breaks down into a twin sized daybed. Most of the time, the bed is made up as I like to have a separate space to read/lounge/nap. With the nice weather, we've been eating outside so haven't had the need to use the dinette table. Dinette cushions: Sewn from Premier Print indoor outdoor fabric and sprayed with Scotch Guard fabric protector. 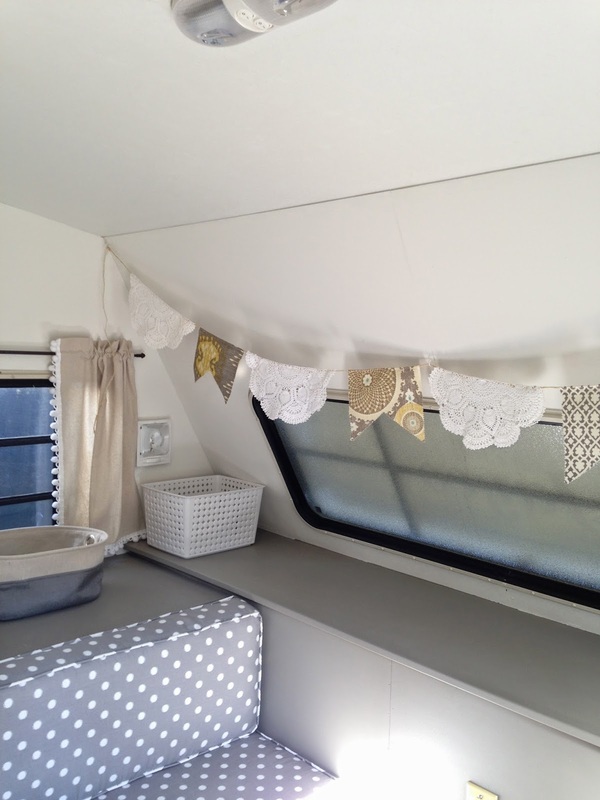 Bunting: Fabric scraps and my Grandma's doilies strung on jute rope attached with cup hooks. Window Decal: From Lowes and gives the big window a "frosted" look when rock guard on window is open (which is rare). 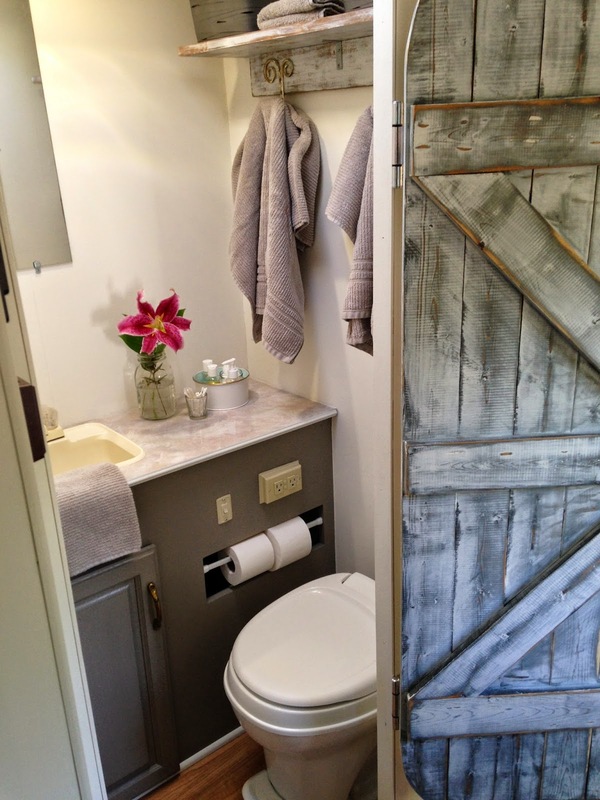 Paint: Walls in White Dove and cabinet faces are in Beige Shadow by Valspar. Bedding: Sheets are from Target and Quilts are from Homegoods. Dinette Bases: Stained in Water-based Mini Wax in gray. Refrigerator: Painted with Paint and Primer/Valspar in Ebony Fields. The recycling and garbage cans from Target fit nicely in this spot. The smallest room but is a step up from the bathroom that we had in our truck camper. Vanity: Painted in Beige Shadow by Valspar. Antique brass pull from Lowes. 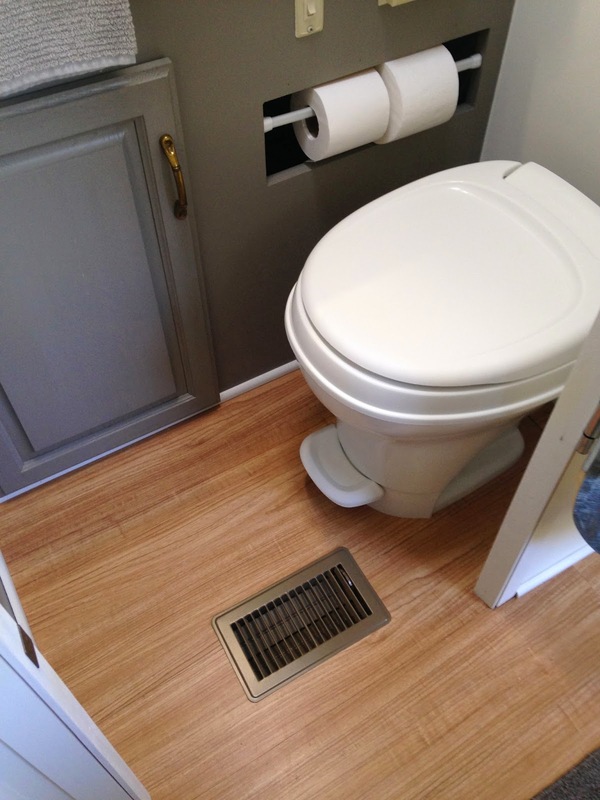 Toilet: It's new and comfort height with a foot flush pedal! I lost the use of the drawer, but the TP fits snuggle in it's space on a tension rod. Mirror: Existing, but removed the cheap wood frame and just used metal mirror clips for more modern look. Shelf: Built from scrap wood and installed with L brackets. There was a bulky medicine cabinet here that I removed. Gray baskets are from Target. Towels are Quick Dry by Martha Stewart/MACYS. 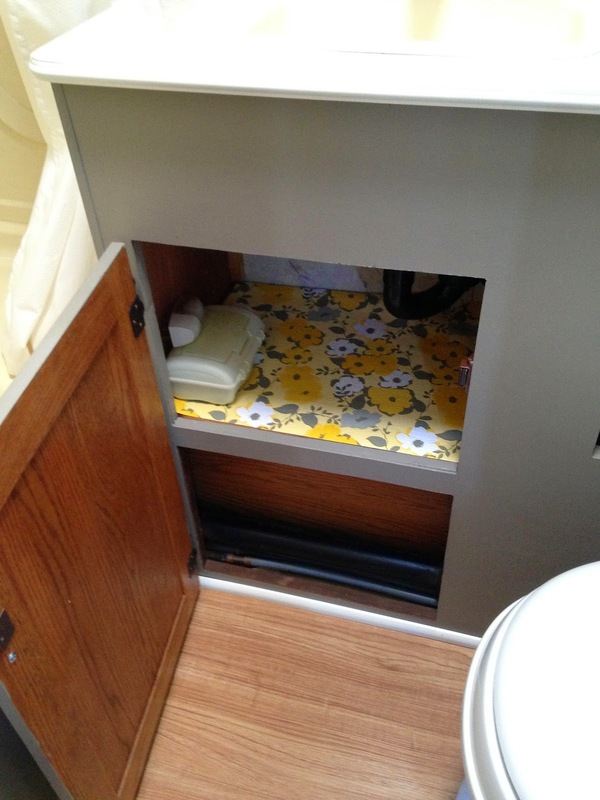 I replaced 3 floor vents in the camper and upgraded them to ones that open and close. They were purchased from Lowes and work great. They are removable for easy cleaning. Shower Curtain: Target. It's a fabric liner, but I hemmed it and so far it's working well. Roller rings from Walmart. Rod from Target installed into closet rod cups from Lowes. This helps keep the rod tight even through transport over bumpy roads. Command Hooks from Target. 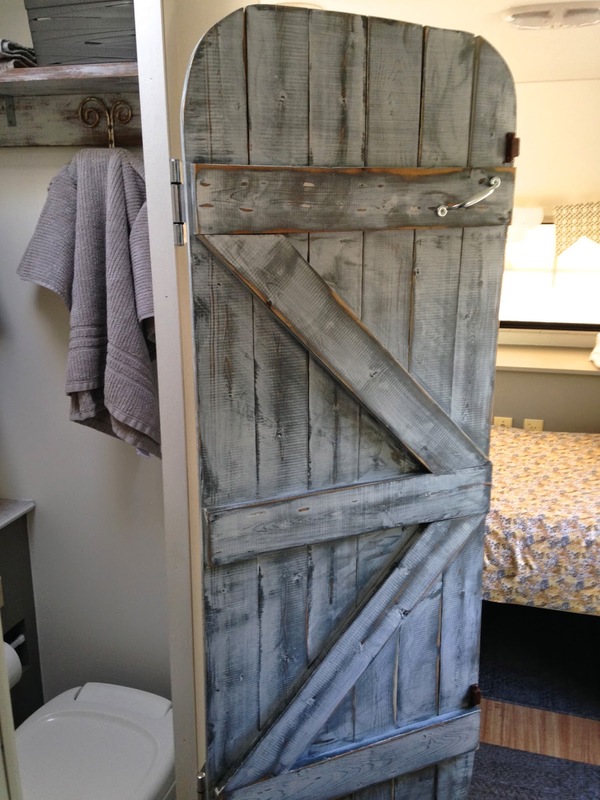 Barn Door: Made from Cedar Scrap wood. Stained gray and then white washed. Gate hardware all from Lowes. 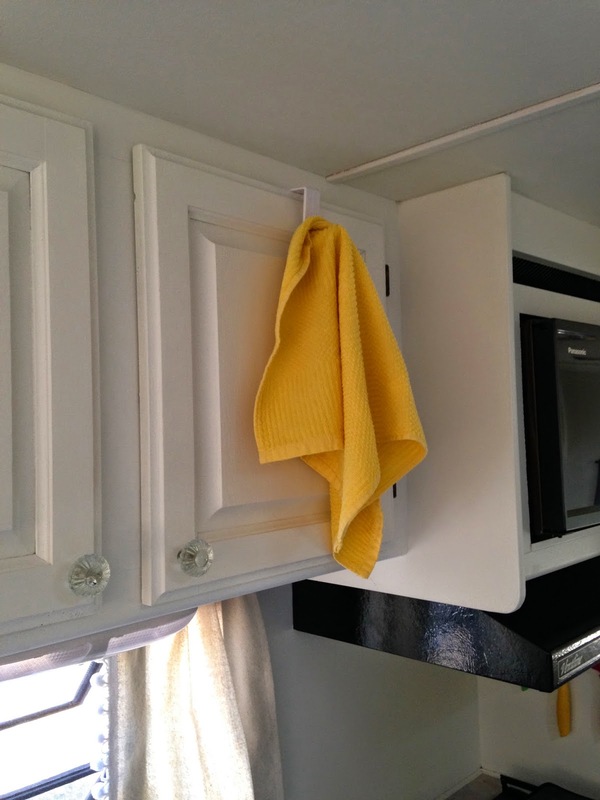 Magnetic catches keep the door closed when in use. 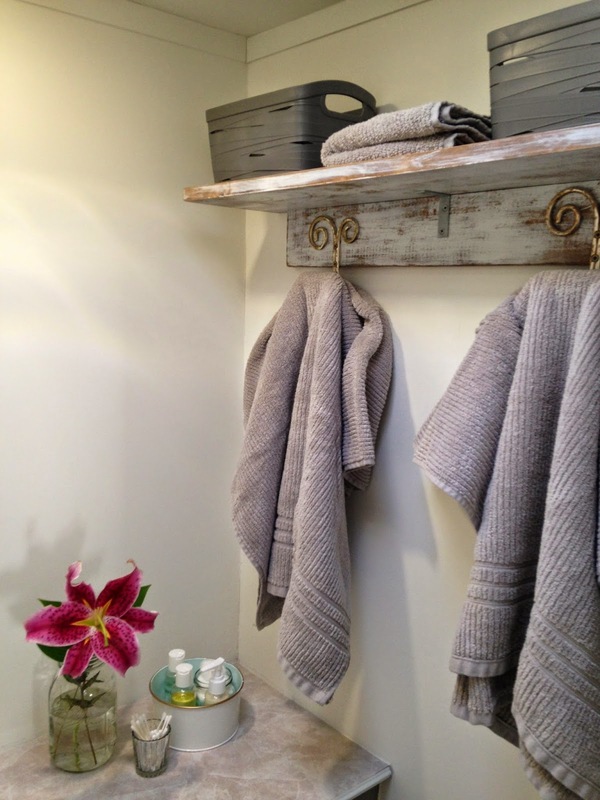 The bath vanity has a small storage area where we normally keep baskets with toiletries. Lined with DUCK shelf liner from Lowes. I never painted this spot next to the tub. 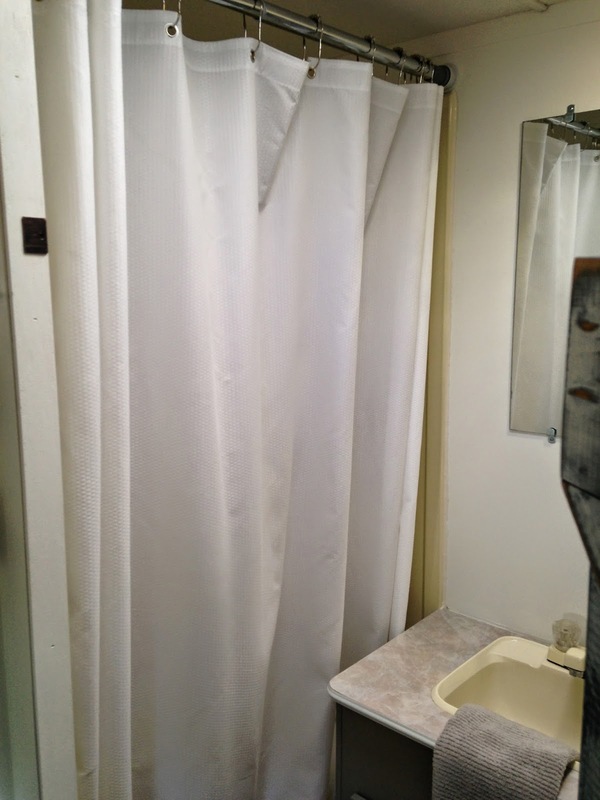 The shower curtain covers it. I kinda like that it reminds me of the ugly print that was all over the camper walls. Organizer: Shoe organizer from Target that holds ALOT. Bugspray, flashlight, comb, hose sprayer, sunscreen, sunglasses, etc. Bed and Bedding: New Innerspring Mattress, Memory foam topper and Quilted Mattress Pan in Queen Short size from Camping World. (Love a new mattress!). Sheets are from Target. I used regular Queen size and they fit fine. Making the bed is a pain because it's a tight fit, but glad to have Queen size. There was a full size in here when we bought it. Quilt is one I had and was purchased from West Elm. 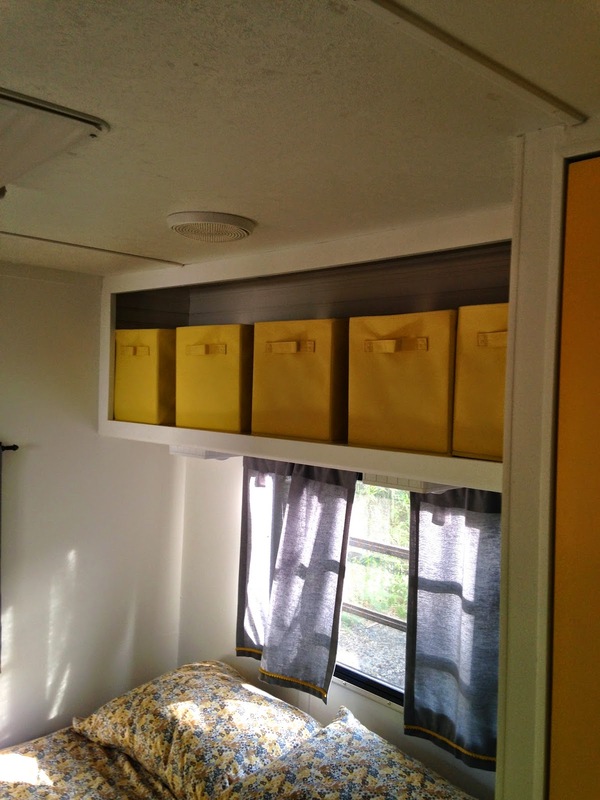 Storage: I removed the doors and framing from the overhead cabinet. 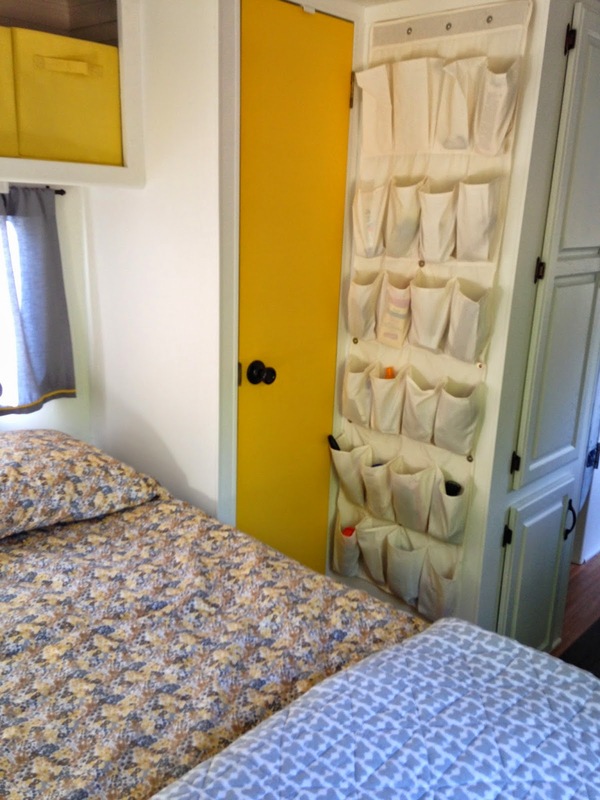 Backed it with beadboard and we store towels and clothing in the yellow totes from Lowes. Curtains: Cafe Curtains from JCP that are trimmed with mini yellow poms from Joann's. 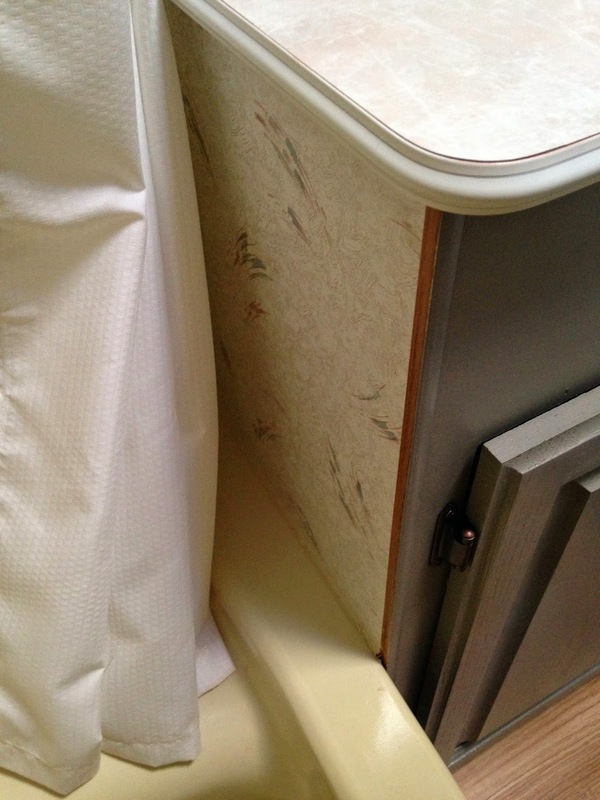 Roller shade: Vinyl roller shade over ceiling hatch from Camping World. 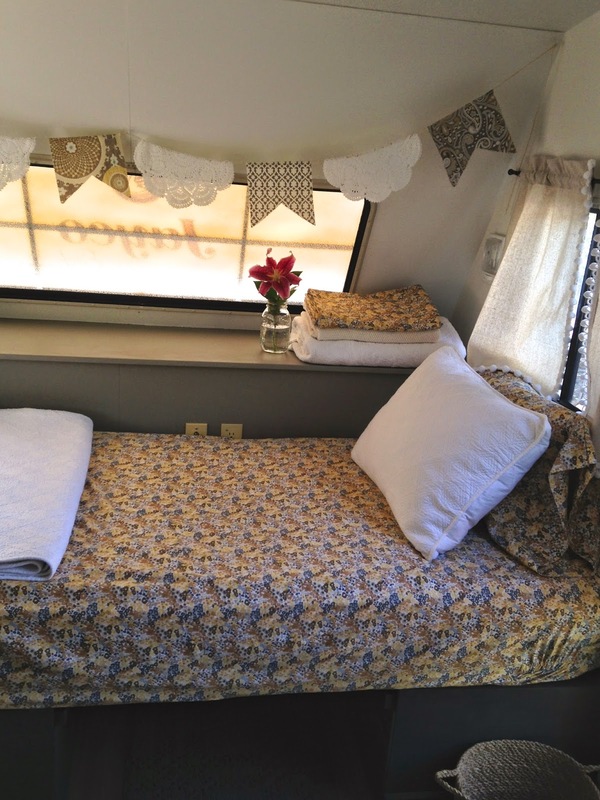 Thanks for stopping by and checking out my Camper Redo!